← Doin’ nothin’? Nothin’ doin’! On Sundays most big stores are closed here. A few grocery stores might be open in the morning but by lunch time even those employees get to spend the rest of the day with their families. They do indeed get to go home but they might not stay there since there are often many other shopping opportunities available as there were last weekend. 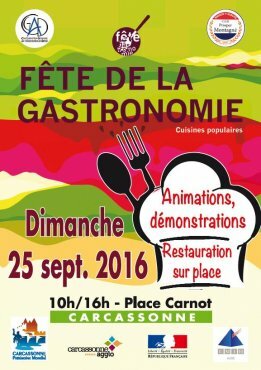 Food and drink often take the forefront in France and the festivals that salute them just add to their appeal. 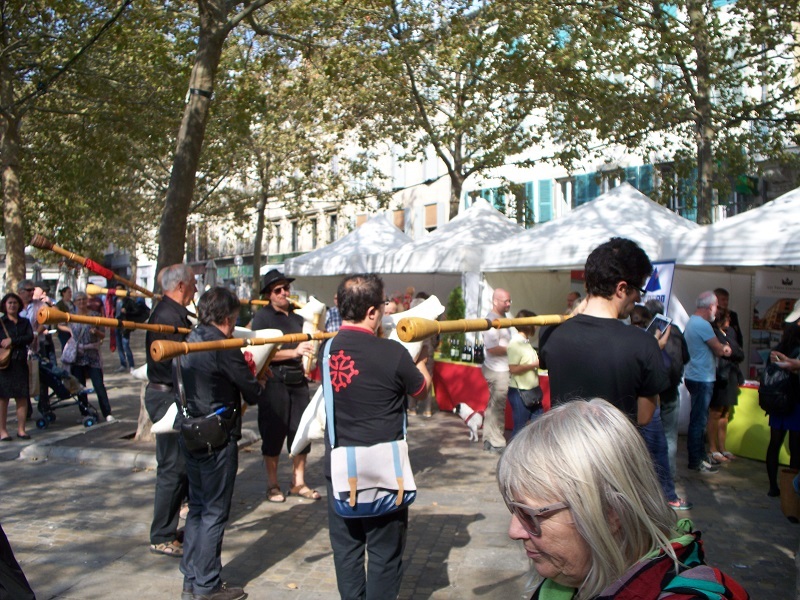 Two weekends ago we attended Carcassonne’s “Day of Taste” where chefs from several of the city’s restaurants used local ingredients to prepare tasty samplings of their work. There was a special emphasis on involving children with their parents in making healthful meals at home. This past Sunday those same tables were occupied by local artisans and vendors participating in the Gastronomy Festival. As the name suggests we were treated to displays from a butcher, a baker, an ice cream maker, a green grocer, a fishmonger, and numerous restaurateurs. But what about something to drink? In this land of wine, naturally there was more than one table devoted to products from the nearby vineyards. Carcassonne has at least 2 breweries so beer was represented as well. When not sampling the goods on offer, we could watch demonstrations of cooking, juicing, breadmaking, flower arranging, and table decorating. Some of the sidewalk cafés that surround the main town square where this fête was held were open as was a chocolate shop and a wine store which just added to the cheerful Sunday atmosphere. After this festival it was time to walk over to our new house where another sales event was taking place. 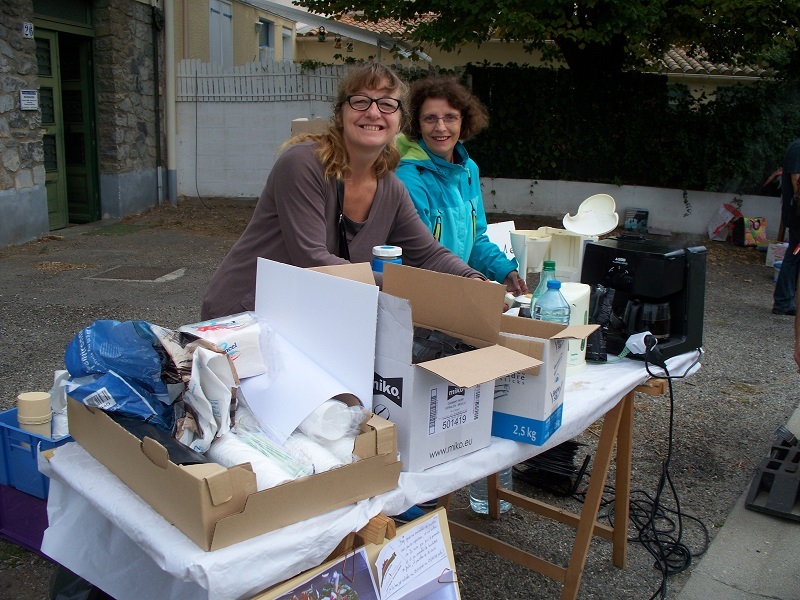 At the beginning of the month we went to the garage sale where our rental house is located so it was now time to see what was available at the Vide Grenier (literally, Empty Attic) on the street where we’ll be moving. We weren’t looking to buy anything but went with the goal of connecting (and reconnecting) with our soon-to-be neighbors, many of whom we had already met by chance on the street or at two parties we’ve already been to that many of them attended. Although our Sunday was filled with shopping, there were other options that same day that didn’t involve spending a euro. On the city’s website I saw that there were two concerts, a family sports fair, and a ceremony honoring the country’s armed forces. 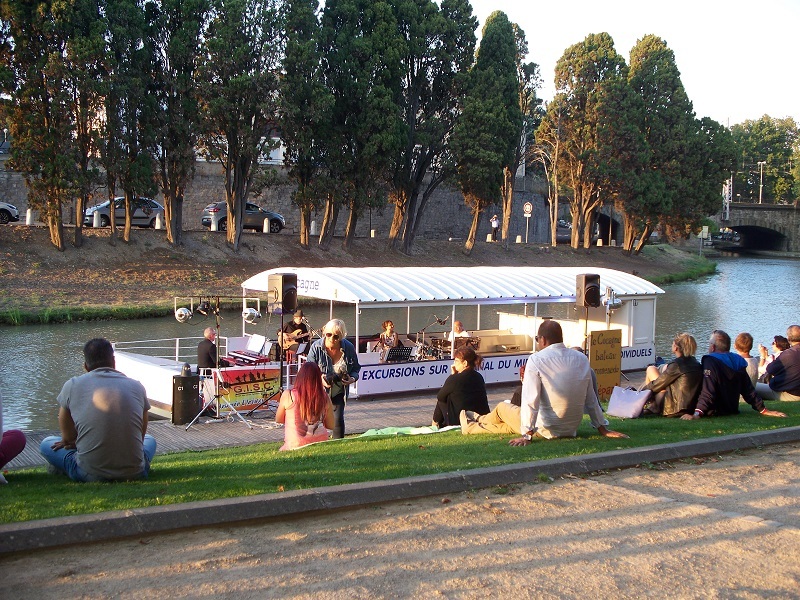 One of the city’s 3 newspapers added that CanalFriends, an organization that promotes sustainable tourism, would be hosting activities of discovery on the Canal-du-Midi, where, by the way, we had attended a free jazz concert the night before. I looked ahead at next week’s schedule and I’m wondering how we’re going to fit everything in. That’s a nice dilemma. While living in North, Central and South America, in the middle of the Caribbean and the Pacific Ocean, and now in Europe, my passion has remained the same: travel and meeting new friends. Posted on September 30, 2016, in Life in France and tagged Americans in Carcassonne, Carcassonne, Community, Food, Life in France. Bookmark the permalink. 2 Comments. The Bastide of Carcassonne used to have a brewing district (each métier had its district) in the late Middle Ages. The brasseries were up near the Lycée Varsovie. How do you have time to work on your house?